Apple has always had a really impressive line up of features to help students with disabilities – vision, hearing, motor and learning. Simple adjustments can be made in system preferences to provide learners with the support they need. If you are interested in learning more about the capabilities of your laptop computer, be sure to check these resources. Snow Leopard Accessibility Features (DOC) – Created by Bill Ziegler from Bucks IU 22, the document reveals the array of accessibility features in Mac OS 10.6 (Snow Leopard) Easy-to-follow, step-by-step instructions for activating the features are included. Snow Leopard is the OS (operating system) currently on all student and teacher machines. Educational Software for UDL and Special Needs – Bill Ziegler also has a site containing reviews and links to several software tools useful for special needs learners. 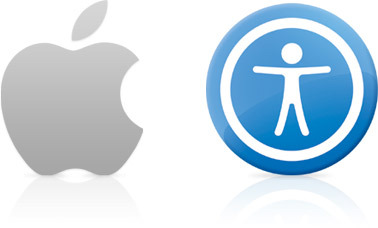 Apple has resources that outline upgrades to accessibility features that appear in the latest OS – Lion (OS 10.7). The District plans to upgrade all student and teacher machines to Lion during the summer of 2012. Apple in Education: Special Education – The arrival of OS X Lion ushers in a new era of accessibility for students of all abilities. Every Mac comes equipped with dozens of assistive technologies — many of which you won’t find in other operating systems. Using Apple Technology to Support Learning for Students with Sensory and Learning Disabilities (PDF)- This white paper provides an overview of educational technology policy and practice with concrete examples of how teachers, students, and parents can use Apple technology to make a difference for students with sensory and learning disabilities. Assistive technology features are not just for special needs learners. They can have universal appeal depending on your particular need. Be sure to check out these resources to learn the specific accessibility features available!